Were Karen Walker ever to consider an about-face career change away from fashion, she would do well to consider casting. 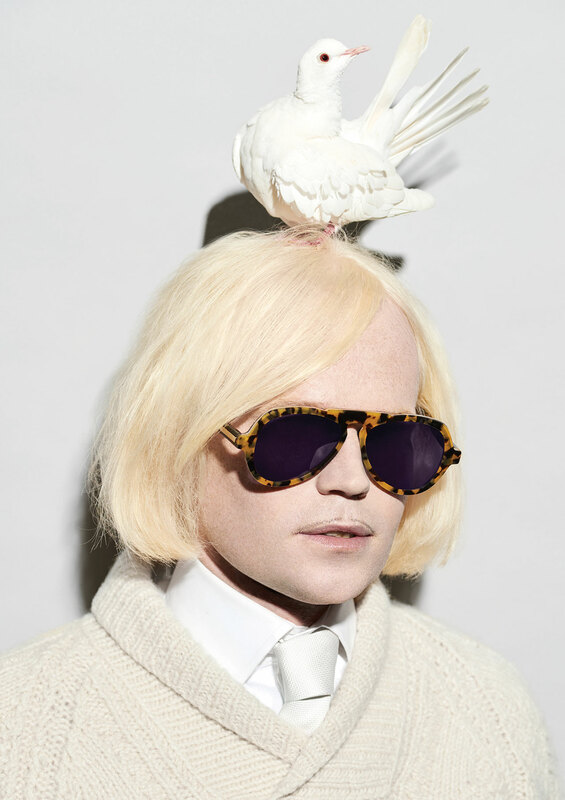 The characters that the designer assembles for each successive instalment in the often surreal Karen Walker brand story are often as integral to its telling as the photography, hair, makeup and, sometimes, the apparel itself. 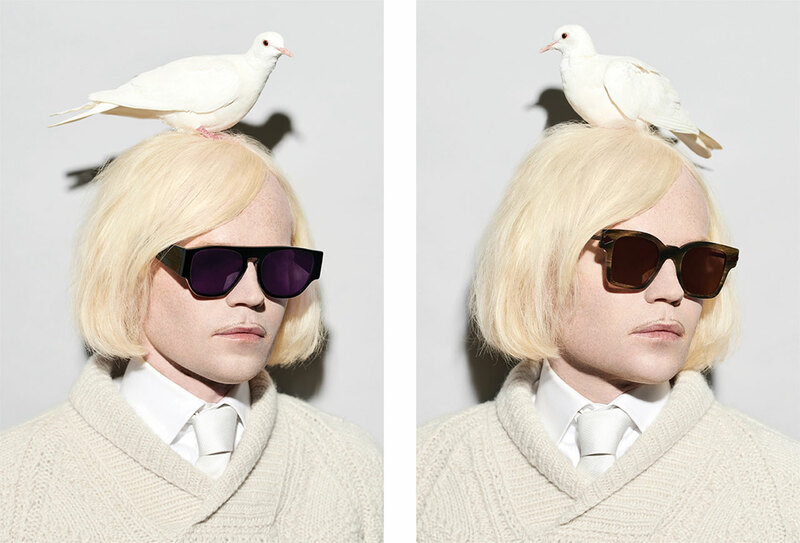 For her debut men’s eyewear collection, Monumental, Walker elects fellow New Zealander, the musician Connan Mockasin, as her statuesque muse. Together, they appear alongside Jared, a rescue dove whose parents were allegedly attacked by a ferret and killed when he was only two days old and who, after a warm bath and time under a heat lamp, was resurrected. See what I mean about the casting? Below, exclusive to GRAZIA, the designer (in bold) and her collaborator appear in a candid conversation on clogs, kimonos and cockatoos. The first song I ever heard of yours, and instantly fell in love with by the way, was Megumi The Milky Above played on Amsterdam Acoustics. In it, you were singing in a falsetto voice and playing percussion on a clog which, for me, was such a fashion moment. Do you think you’re the first person to ever do that? I’d be very surprised if I was Karen, I’m glad you enjoyed that. That was a long time ago. Would playing percussion on a brogue or a work-boot have been more manly? As the very first Karen Walker Monumental man how do you feel about playing at being a Monument? Can you picture yourself cast in bronze in a town square? In your hometown perhaps? I feel proud that you have chosen me Karen, but I wouldn’t feel comfortable cast in bronze. Would you prefer bronze or marble? After three hours of shooting the campaign with Jared the dove sitting on your head did you feel you bonded? He was a really well-trained bird, but we needed more time together. Considered getting a pet bird since then? It works for Iggy Pop and his Sulphur-crested Cockatoo Biggy. I can just see you posting videos of yourself doing sits up with a budgie sitting on your abs. I did have a pet canary, called Jitz. What’s the manliest item in your wardrobe? I’ve got a leather vest. And the girl-iest? I bet you like to rock a kimono around the house. I have some of Farrah Fawcett’s old kimonos and gowns that I wear around the house, yes. On the shoot we tried a scarlet lipstick on you and it looked great against the paleness of your skin and hair. Drag up ever? You live in LA, you’ll be needing a few good pairs of sunglasses there. Best thing about the sunshine there? My skin is pale and I need to keep out of the sun mostly so yes, wearing sunglasses is good for me here. You can find out more about Monumental at Karen Walker’s website.